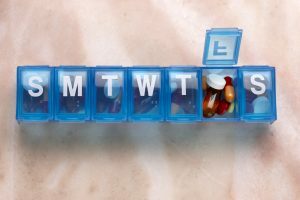 Managing medicines for a patient or loved one can be challenging, especially if they are required to take several at different times of the day. The patient may have difficulty remembering when to take their medicine or may even refuse to do so. This article discusses how as their carer you can correctly and safely manage their medicine. Although anyone can legally administer medicines, they must be prescribed by a medical practitioner. Any patient has the right to privacy, and as a result, it is up to them to decide how much of their medical history is disclosed to you as their carer as well as how involved you are in their care. This is covered when you first meet with them to discuss the patient’s care plan. The most common form of medicine is as pills or tablets. Patients with a complicated medication regime may require different medicines to be administered at different times of the day. A pharmacist can provide what is known as dosette (or dosett) boxes. These are boxes with small compartments that clearly show which pills need to be taken at what time of the day. As a carer, it is important to give medicines at the recommended time of day. Failing to do so can make them less effective. Information relating to individual medicine can be found either in their packaging or by contacting the person who prescribed them. Instructions include when to administer them, the dosage and whether or not the medicine needs to be taken with water, food or in between meals. Using the dosette boxes allows you to separate the types accordingly and ensure that the patient can take them in your absence. It allows helps them to remember whether they have taken medicine earlier that day. 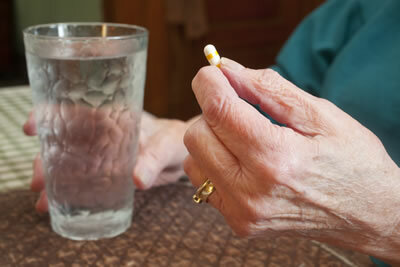 Patients that have a long-term condition such as diabetes or arthritis often require more than one type of medicine. If this is the case, they should be able to get what is known as a ‘free medicines use review’ with their patient. This an opportunity for them (and possibly you) to talk to the pharmacist in confidence about any problems they have with their medicines. Attending the medicines use review with the person you care for will allow you to understand the correct order for them to take their medicine, in the appropriate dose and at the right time. It also helps you both understand what side-effects to look out for in case the patient has a bad reaction to the treatment. Medicine should always be kept in one place in the patients home, preferably in a locked drawer or cupboard. This is extremely necessary if children visit or live in the same property. You need to ensure the patient doesn’t run out of their medication and that repeat prescriptions are dispensed in time so that there are no gaps in its administration. Most GP surgeries can send prescriptions directly to a preferred pharmacy. Some pharmacists also offer home delivery for patients that have mobility issues. If a dose of any particular medicine is missed – ensure you follow the correct procedure for further use. Different drugs have different rules. It may not be safe to take a larger amount if they miss one dose so don’t assume that you can double-dose at any time. Check with their pharmacist or doctor if you are unsure. Don’t assume over-the-counter medication can be used alongside prescribed medicines. Check with a doctor or pharmacist that it is safe to do so. Return any surplus medicines to the pharmacist for safe disposal. Ask the pharmacist about supplying automatic pill dispensers. These devices can be set to dispense the correct number of tills at a set time and make a beeping sound when medicine is to be taken. Consider telephoning the individual at times they need to take their medication. This can be useful for patients that have long-term memory loss, where they can remember what has just been said but can’t remember if they took medicine earlier in the day. If you are part of a care team, arrange for care workers to visit the patient at a time of the day their medication needs to be taken. If it is a family member, work with other family members to arrange a timetable of when people visit and coordinate it so that it is at times that medication is required. Sometimes the patient or person you care for may be unwilling to take their medicine. They may feel the medication is not working or be unhappy with the disruption. When this happens, it may be sensible to speak to their GP or pharmacist. They may be able to suggest alternatives such as painkillers that can be prescribed as a 24-hour patch that is placed on the skin rather than as a pill. Never give medication to someone without their consent or try to force them to take it. Always treat the individual with empathy and respect regardless of how frustrating it may be for you. All patients have the right to refuse medication. It is not safe to crush tablets, or open capsules and mix them with food or drink. Some people need help when swallowing pills. If you’re worried that the person you care for could choke ask their GP or pharmacist if it can be supplied in a liquid or soluble form. See more about swallowing difficulties (dysphagia). Online Care Courses offers a course on the safe storage and administration of medication. The course covers different types of medication, their classifications and teaches individuals various techniques in its safe administration. It also explains the rights of the patient, how to correctly record all medication administration and ensures that you, as the carer, safely comply with all laws and legislation.